Have you ever tried a battered Mars Bar? You'd love it - I know this for a fact. Actually, I don't believe I've ever met somebody who has tried one of these guys and hasn't walked away thinking they just ate one of the most delicious things you can find on this planet of ours, or anyone else's for that matter. But sadly, we're in the minority. Most people will turn their noses up at the thought. To most people the idea of wandering half-cut into a chip shop after midnight, asking the poor boy operating the fryer to unwrap a chocolate bar, dunk it in thick batter, and then deep fry it to within an inch of its life is, quite simply, absurd. Fortunately for you lot, I'm not most people. I've been there, I've done that, and I ate the damn thing. Now I'm gonna show you how to do it at home. Let's start with - in my humble opinion - the perfect chocolate bar. Milk chocolate, nougat and caramel - three simple ingredients that work together to produce a symphony of flavour that just cannot be beaten. That is, of course, unless you're going to batter and fry it. That's the old 'cranking it up to 11' trick right there. You need a nice thick batter to protect the chocolate bar as it fries. Too thin, and the second you drop your chocolate bar into the hot oil you'll end up with nothing more than an oily, melted chocolatey mess. (Full disclosure, I may have eaten more than one Mars Bar during testing...). About 120g of plain flour mixed with about 150ml of sparkling water should do the trick. Aaaaaand dunk. 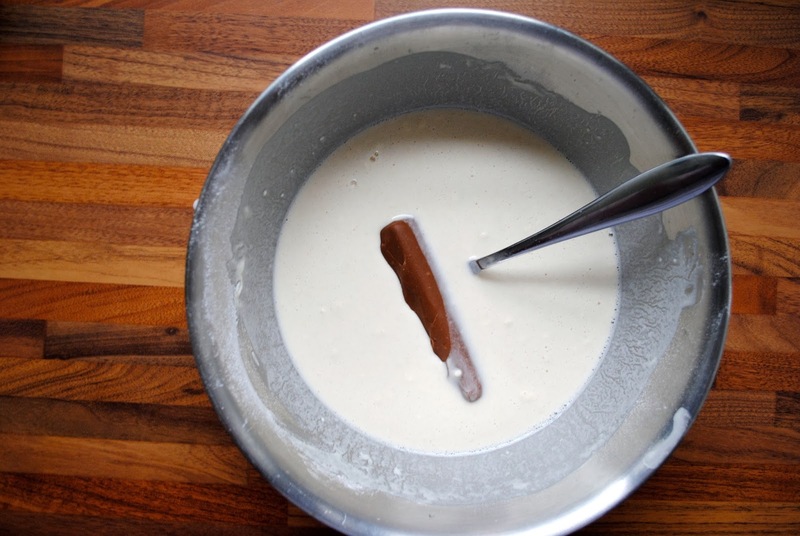 If your mixture looks to runny at this point just add more flour - it wants to be proper thick, and clinging on to the chocolate bar. Get yourself a saucepan, fill it with a couple of inches of vegetable oil and heat it to roughly 190C. If you're unsure just drop a breadcrumb in - if it starts to fizz and floats to the surface, you're ready to rock and roll. Carefully lower your Mars Bar, leaving it for about 2 minutes until the batter browns up and gets nice and crispy. Using tongs or a slotted spoon carefully pull your Mars Bar out and let it sit on napkins or parchment paper for a second or two, just for the excess oil to slide away. And that's all there is to it. Like many of my recipes, I wouldn't recommend eating too many of these things in one sitting. In fact, I'm pretty sure the last time I had one of these I was about 17. I'm now 27, and I'm still thinking that this was a bit too soon. Ah well, they're bloody delicious and that's all that matters. Gooey, melted chocolate and caramel all encased in a crispy batter? Sounds good to me. At this rate I'm going to be dead before I hit 30. But at least I'll be well fed. "Gooey, melted chocolate and caramel all encased in a crispy batter?" I DIE! This looks like something you'd find in county fairs across America! Love it. I had deep fried (battered) oreos once at the NY state fair. Amazing! ship hàng nhật ở địa chỉ nào là tốt ?